I first heard about Isa Leshko a couple years ago, not long after she published Thrills and Chills, her first book of photography. 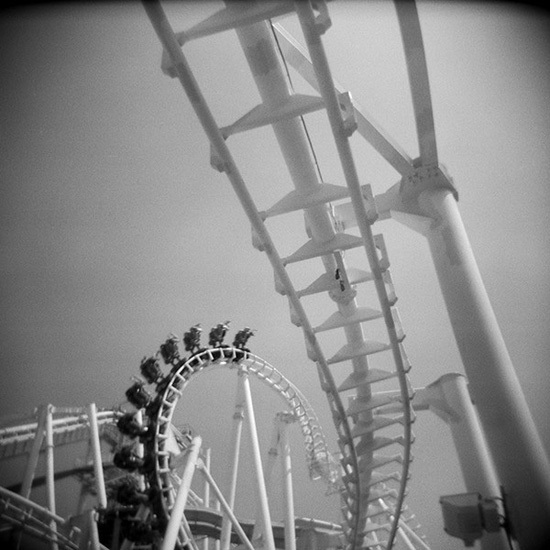 All I knew of the photographer and the project was that she used a Holga to photograph amusement parks and carnival rides. My first response was to shudder. A toy camera? At an amusement park? It sounded terribly precious and cute. I ignored the project; I ignored Leshko. I almost made the very same mistake when I heard about her second project, Elderly Animals. A project revolving around portraits of old animals? The potential for maudlin, sentimental, pretentious photographs seemed awfully high. I very nearly ignored Leshko again. That would have been a terrible mistake. Leshko was born in 1971 in Rahway, New Jersey. She describes herself as “a nerdy and lonely kid” who spent “most of my free time reading and playing Atari.” She attended Haverford College in Pennsylvania—a liberal arts college grounded in Quaker values—where she studied neuroscience and cognitive psychology. Leshko mentioned that to her first instructor, who simply took a Holgo off her shelf and handed it to her. One weekend she took a break from caring for her mother and visited relatives. She came across Petey—a blind 35 year old horse—and spent the afternoon using one of her Holgas to photograph him. “When I reviewed my film I began to realize that I had a means of exploring my feelings around aging and my mother’s illness.” And another project was born: Elderly Animals. Leshko began traveling around the country, visiting animal sanctuaries and shooting portraits of geriatric animals. She photographed farm animals, pets, escapees from industrial farms; she photographed horses, goats, chickens, dogs, pigs, turkeys, swine. Petey, however, isn’t part of the project. Leshko decided the Holga she used to photograph the old horse wasn’t the right camera for this project. She chose to use a Hasselblad 503 CW instead, “so I could make more formal portraits of my subjects that are unflinching in their detail.” Sadly, Petey died before she could return with the Hasselblad. Because farm animals—even old ones—can move unpredictably fast in unanticipated ways, Leshko found she couldn’t use a tripod. She also decided to photograph the animals at their own level, which meant a lot of time squatting or sitting on the ground—even lying down. And that wasn’t just while she was shooting film. 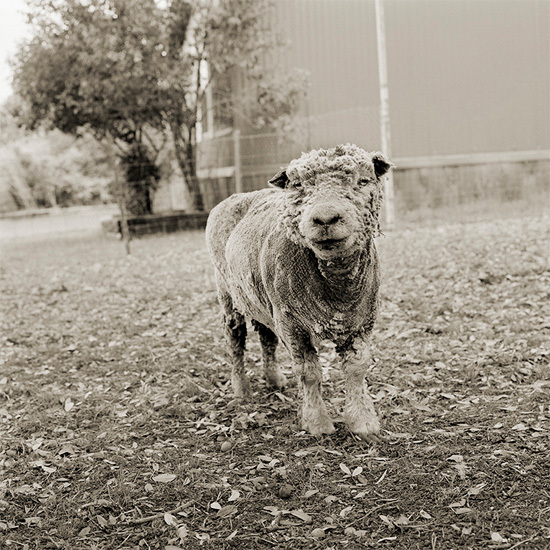 “I spend several hours with the animals I photograph and I try to visit them multiple times. Depending on the animal, I may spend an hour or so simply lying on the ground next to the creature before I take a single image.” That sensitive approach gives the animal time to become accustomed to Leshko’s presence and gives her a chance to familiarize herself with the animal’s habits. There’s additional facet to these images that often escapes attention. How is an animal’s age judged? 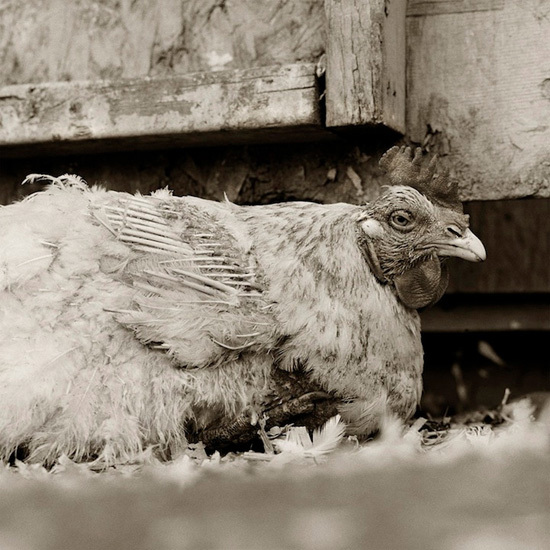 Farm animals rarely live out their natural life span. Depending on the breed, the natural life of a chicken is somewhere between six and ten years, but chickens raised in factory farms are routinely slaughtered at around 45 days; free range chickens are generally butchered before they reach a hundred days. Nor does anybody note the date of birth of a chicken. 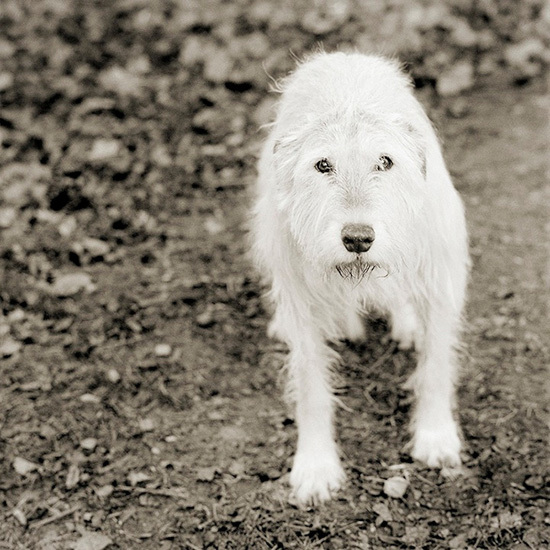 What strikes me about these photographs of elderly animals, though, is the stillness. The quiet. The patience. Each of the portraits reveals an understated equanimity. I have no idea if this is a matter of the way Leshko edited the series, or if it’s actually a characteristic of the animals. I’d like to think it’s the latter. I very nearly ignored Isa Leshko. I’m glad I didn’t. She’s managed something remarkable. She has approached subjects that in most hands would have been unbearably sweet and maudlin and transmuted them into something thoughtful, interesting and honest. She’s done that with absolute integrity. I regret I denied myself the pleasure of seeing her work for so long.